: Do I file divorce paper? : Can I leave social life due to police atrocity or do I live with police atrocities like many common men live? Is it my fault being a relative of Vijaya Kumar Arya? How long days the parliament and the states assembly would silence on these questions? In such a situation every day I face new challenges for my survival. Now what I do now? It was the year of May, 2005 I got married off with Shobha Kumari the daughter of Vijay Kumar Arya, a moist leader as police of Indian states said. I believe it was my unfortunate that I am a son in law of vijay kumar arya and making this point as a base police has filed a case of sedition against me. Even I am facing trial in civil court Patna and running on bail. Vijay kumar arya what he is in personal life that doesn’t matter me and never intervened in their all affairs. I respect him only as my father in law. Every now and then I visited near to him although he is in jail in Vishakhapatna. On 16th march, 2013 I went to Vishakhapatnam to see him. I met him in the jail and asked his wellbeing. After coming out from the jail I return back to my hotel room with my other colleagues but what was happened there with us was totally shockable. 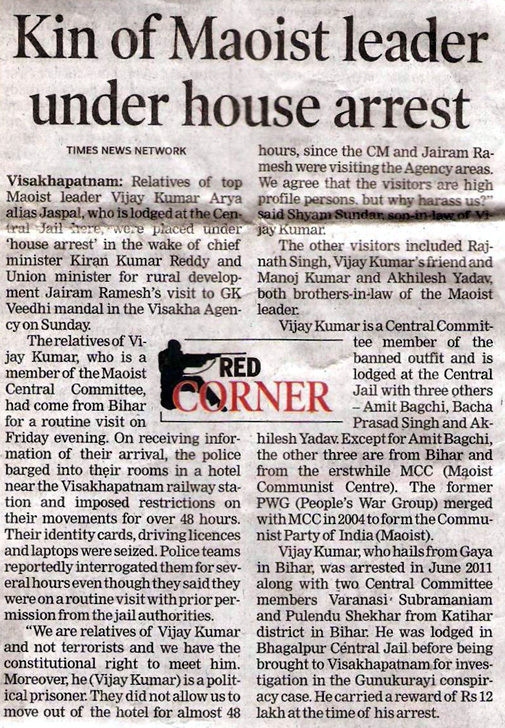 The Andhra police kept us HOUSE ARREST in hotel room for 48 hours. Myself Shyam Sunder by profession a journalist and got my degree of Master in Journalism from MAKHAN LAL NATIONAL UNIVERSITY OF JOURNALISM, Bhopal in 2004. After passing out from the university I got job in DESHBANDHU and Navbharat, Bhopal. I worked there about a year then after I moved to Patna. In Patna I joined Leading Hindi Daily Hindustan as a crime reporter. In my career of journalism I got many more opportunity in different leading national Hindi dailies like Amar ujala, public agenda and so on. I left many questions in the above of this story kindly pass your suggestion for making my life easy going.